Moms, none of us like to see our little one in pain! It breaks our hearts (and our ears). These soothing techniques will help Baby’s gums feel great by reducing pain and swelling. When my kids were just babies, the last thing I wanted to give them was a drug or any unnatural substance. These can be too harsh on Baby’s new body and young digestive system. So, here are some all-natural, safe, and easy ways to soothe Baby’s gums and dissolve his pain away. Simply, use a clean finger to gently rub across Baby’s gums. This is safe and effective in beginning stages. While, teething gels seem like an obvious soother, parents often buy the wrong gels that are too hard on Baby’s gums. My children loved these ice pops growing up. 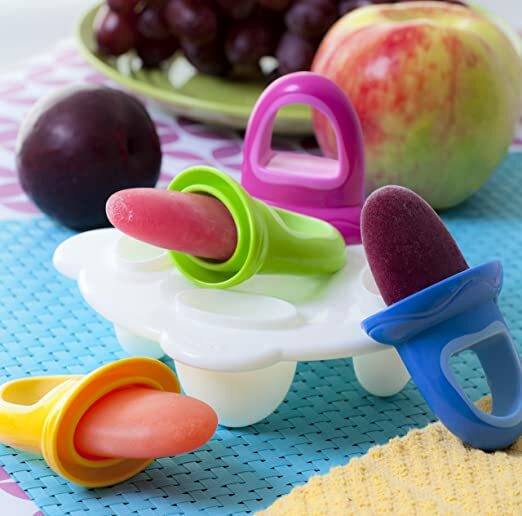 You can fill these with any fruit, store in the freezer, and they act as a teething popsicle while delivering a healthy snack at the same time. “Baltic amber is ancient tree sap that comes from a special geographic region and has been rolling around in the Baltic Sea for a few million years. It has a comparatively high concentration of succinic acid (3-8%), which helps alleviate teething pain (among other things). When worn, baby’s body temperature warms the amber which then releases the acid into the skin and blood stream.” -Rebecca, mom of twins. Rosehip – Packed with vitamin C and antioxidants, rosehip tea is great for boosting the immune system. Additionally, rosehip has been shown to contain anti-inflammatory properties. Chamomile – Chamomile is a popular remedy for teething pain. It helps relax and soothe irritability. Catnip – Catnip is said to calm irritable babies and help them rest. Clove – Clove is a natural anesthetic and has been shown to work as well as benzocaine at relieving pain vs. placebo. Any of these herbs can be made into a tea, which can be used to dampen wash clothes before freezing. You can also give the tea to baby as a beverage, or rub it directly on the gums. To make a tea, boil water and steep 1 tsp of herbs in 10 oz, of water for 6–7 minutes.